Scientific notation is like shorthand for writing very large or very small numbers. Instead of writing the number in decimal form, the number is shortened to a number multiplied by a power of ten. The first number in the mathematical equation is called the "coefficient." The coefficient must be greater than or equal to one and less than 10. For example to create the scientific notation for the number 256, the coefficient would be 2.56. The second number in the equation is a power of 10, written as 10 with an exponent, like 102 which stands for 10x10. Combining these two numbers would create this scientific notation equation for 256 - 2.56 x 102. 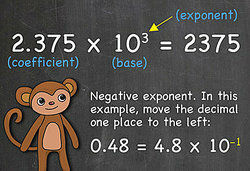 A negative exponent shows the decimal is moved that many places to the left and a positive exponent shows the decimal is moved that many places to the right. Scientific notation can make it easier to perform mathematical functions with large numbers. Now you see lots of examples of scientific notation. "Scientific Notation Examples." YourDictionary, n.d. Web. 19 April 2019. <https://examples.yourdictionary.com/scientific-notation-examples.html>.